Paul Bridges leans toward his desk, picks up the phone and punches in a number with the fast, laser focus of a man on a mission. The mayor of this tiny town in South Georgia is ready for battle — and looking for a new weapon. “I need some help getting a website,” he says, spelling out the words of the domain name he wants for a site promoting immigration reform. The man on the other end says he’ll try to help. But that isn’t enough for Bridges. Bridges wants the federal government to come up with a solution that gives the millions of undocumented immigrants in the United States a chance to work here legally. Bridges is an unlikely soldier on the front lines of the nation’s immigration debate. 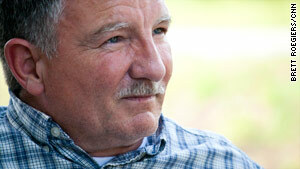 The 58-year-old native Southerner describes himself as a conservative Republican. …[But he] is one of more than a dozen plaintiffs suing Georgia and its governor, trying to stop the state’s new immigration law. They won a reprieve Monday when a federal judge temporarily blocked parts of the law scheduled to go into effect July 1. You can read the full story, and see a video, on the CNN website. “Limited Government, Free Markets, Federalism” – this is the tagline for the American Legislative Exchange Council, an organization that has helped draft model bills for conservative legislators to introduce to Congress for the past forty years. But this is no Tea Party – the exclusive organization is primarily comprised of wealthy owners of mega corporations, including the Koch brothers and Jack Kemp. This tax-exempt organization introduces 1000 pieces of legislation during each legislative cycle, and 18% of these bills are passed into law. One of their most controversial laws? – None other than SB 1070, the 2010 Arizona immigration law, or as they called it, the “Support Our Law Enforcement and Safe Neighborhoods Act”. 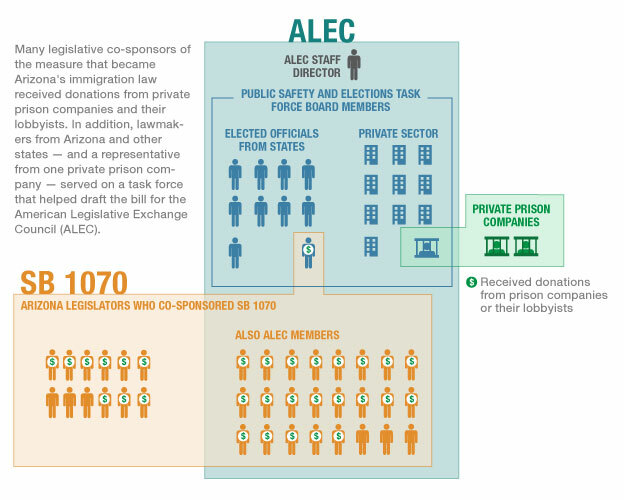 Worst of all, several members of the private prison industry collaborated with ALEC to lobby for SB 1070. Thus, it appears that Congress, the major corporations, and prison detention centers have become intertwined in this deplorable business deal to secure power over poor migrant workers, all in the name of “law enforcement and safe neighborhoods”. The African gorilla has long been seen as one of the most intelligent endangered species in the world. Sadly, it appears that the heightened illegal charcoal trade in the Congo has prompted the execution of several mountain gorillas. This is especially significant because there are only 700 of these gorillas in existence worldwide. This video nicely encapsulates the multiple strands of illegality that converge on the issue of undocumented workers. 700 people arrested and detained for working illegally and having used false identity papers; at the same time, the meatpacking company for which they work is being investigated for violation of health and safety laws, child labor violations, allegations of sexual harassment, and for withholding pay from their workers (who, being undocumented, have no legal standing to sue for withheld wages). If you’ve read Fast Food Nation the story of the meatpacking plant conditions will be familiar. You are currently browsing the caminocasebook blog archives for June, 2011.